Lowest business loan EMI as on 21 Apr 2019 is Rs. 2,301 per lakh. Banks offering lowest EMI on business loan are Corporation Bank. As per the current rate of 13.50%, DCB Bank offers the lowest business loan EMI of Rs. 2,301 for 5 years on per lakh loan amount. The EMI can vary depending upon the interest rate, loan amount and loan tenure. Higher the loan amount, higher will be the EMI. Loan amount – The amount you need to borrow for business expansion or purpose. Higher the loan amount, higher will be the EMI. Rate of interest – The interest rate on a loan is an important determinant of the EMI. Higher the interest rate, higher will be the EMI and vice-versa. Loan Tenure – Longer the loan tenure, lower the EMI. Longest loan tenure for business loan in India is 5 years. At the lowest business loan rate of 13.50% for a maximum tenure of 5 years, the lowest EMI translates to Rs. 2,301 per lakh. In this case, you have to pay an interest of Rs. 94,227 on your loan amount of Rs. 1 lakh over a period of 5 years. If you decide to take a loan for 2 years only, for the same rate of interest you will pay a higher EMI of Rs. 4,778 . In this scenario you pay a total interest of Rs. 30,414 on your loan amount of Rs. 1 lakh over a period of 2 years, which is less than half of what you paid for a 5 years loan. An amortization schedule gives a detailed break-up of monthly EMIs on a business loan. Each EMI is composed of principal and interest component. EMIs are equal installments you pay to repay your loan. While each EMI is equal, the components of EMI, that is the interest payment and principal payment are not the same every month. In early days of repayment, interest component is high and principal component is low. This is the reason that many times when you decide to prepay your loan you are surprised to know that a significant proportion of your loan is outstanding, despite having paid numerous EMIs. On an average, you repay back only 17-18% of your loan in year 1 of taking a five year business loan and not more than 50-55% of your business loan till year 3. So, if you take a loan of Rs. 10 lakh and you decide to prepay your loan at the end of three years, you will still need to pay back Rs. 500,000 or more to your bank. Hence, it is important to understand your amortization table, before taking a loan. Each EMI comprises of a component of interest and principal repaid. Component of interest paid goes down while component of principal repaid goes up in each consecutive EMI. In the earlier years, you repay a very amount of your principal component. In the above illustration, on a business loan of Rs. 10 lakh, interest component is around 63% while principal component is around 37% in year 1 of disbursements. You repay back only 16.7% of the total principal despite paying 12 EMIs during first year. In year 2019 (year 3), on the same loan, interest comprises 39% of total EMI payments with the rest 61% constituted by principal repayments. Up to year 3, you cumulatively repay only 54.8% of your total loan after paying EMIs for 3 year or 36 months. If you decide to prepay your loan at this stage, you will have to prepay 45.2% of our original loan amount. It is advised to calculate loan EMI by using EMI calculator which gives you quick and accurate estimates. Time saving : Using EMI calculator calculates EMI in seconds and saves your time in doing cumbersome calculations. You only need to enter the basic loan details like loan amount, interest rate and loan tenure to calculate the loan EMI. Accurate results : Manual calculations can sometimes lead to wrong calculations and hence, wrong results. EMI calculator allows you to calculate error free EMI instantly. Plan your finances : Calculating EMI allows to assess if you would be able to service a particular level of EMI, based on your income and savings level. Allows to evaluate multiple schedules: EMI calculator also allows you to view the amortization schedules and EMIs for various combinations of loan tenures and interest rates, thus allowing you to choose the EMIs that suits your repayment or servicing capabilities. To keep the EMI same and reduce your repayment tenure. Suppose you take a loan of Rs. 700,000 for 5 years at an interest rate of 13.50%. Your loan EMI works out at Rs. 16,106 per month, with annual EMIs of Rs. 193,282. This is how your original loan schedule looks like till Year 5. If you have Rs. 1 Lakh as surplus amount and decide to keep the EMI same and reduce the tenure, this is what will happen. If you choose the option to reduce your EMI, it will reduce your monthly expense burden and ease off your monthly finances. You pay lower interest compared to what was planned in the original loan schedule as your EMI reduces. However, you still pay higher interest compared to Option 1, in which you decide to reduce your loan tenure after prepayment. If you plan to prepay, continuing to pay same EMI over a shorter tenure can result in significantly lower interest amount on your loan and hence, should be the preferred choice whenever possible. What if I miss EMI payment or there is an ECS bounce? If you miss your EMI payment or if there is an ECS bounce then bank may charge a penalty. In addition, it will also be reflected in your CIBIL report and your CIBIL score may get impacted. What if I get delay in paying the business loan EMI? Banks charges penalty for delaying EMI payment. The amount of penalty varies from bank to bank. Why it is necessary to calculate EMI beforehand? It is important to calculate your EMI in advance to maintain stability in future payments. When you avail loan, you promise the bank to pay a fixed amount at fixed date every month. So, before availing the loan you should consider the stability of your income, monthly expenses and the existing loan obligations to avoid any discrepancies in future payments. Does the loan tenure affect my EMI for business loan? Business loan can be availed for maximum tenure of 5 years. Tenure affects your monthly EMI. Longer the tenure of business loan, lower will be your EMI. 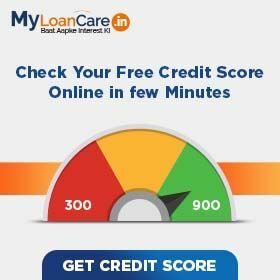 How MyLoanCare EMI calculator helps in calculating EMI? 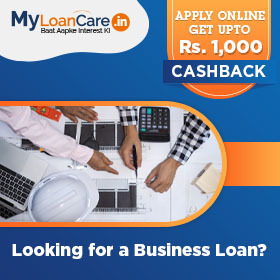 MyLoanCare EMI calculator for business loan calculates the EMIs of different banks as per the details entered by you. You can easily compare the EMIs and opt for the best option. You also get to know about the interest charged on loan amount entered. How is business loan EMI calculated? You can calculate EMI of your business loan through our “Business loan EMI Calculator” which uses combination of loan amount, loan tenure and interest rate to calculate loan EMI instantly online. The EMI calculator also tells you how much interest you would pay throughout the loan tenure. Longer the loan tenure, more the amount of interest for same loan amount you have to pay. What will be my monthly EMI? Monthly EMI depends upon your income and expenses. Generally, banks advise you to limit your EMI to 35% to 45% of your net income so that you can pay your EMI without any burden or difficulty. You can calculate your EMI online which will help you to know your repayment capacity. Is the business loan EMI fixed or can it change in future? Banks generally offer floating rate of interest on business loans if interest rates increases but banks typically keep the EMI constant and increase the loan tenure. So, you will pay same EMI but for a longer duration. However, if your loan tenure is maximum (as per permissible limit) then your bank may increase the EMI amount. You can prepay your loan or you can opt to reduce your EMI and keep the loan tenure same or keep the EMI unchanged and reduce the loan tenure. It is more beneficial to keep the EMI same and reduce the loan tenure. However, you may opt to reduce the EMI in case you so desire. Any other situations as per terms and conditions of the loan agreement.